I would like to share my recent guest bathroom redo. 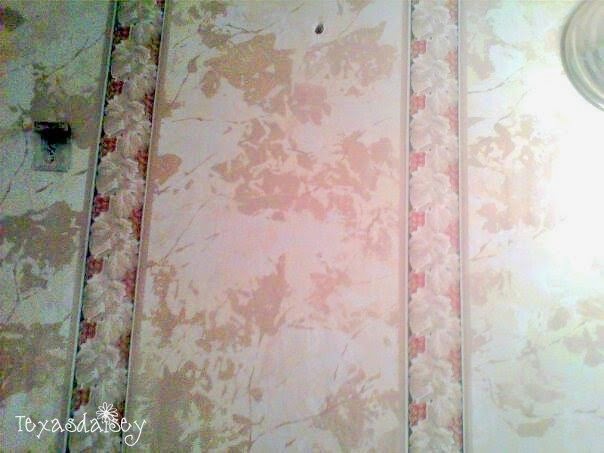 When we purchased the house it came complete with lots of 1980's style wallpaper. I lived with it for a while only because there were other things in the house where we wanted to put our money first but the time finally came when that wallpaper came down. I need to explain about the terrible picture on the left...at that time, I used box cameras...you know those kind you buy at the store, take the pics, send the box in and "they" send your pictures back to you. They usually turned out fairly decent but this particular box camera was thrown in the drawer and not immediately developed so the pictures turned out a bit bad. This picture was also taken while the previous owners still owned it. 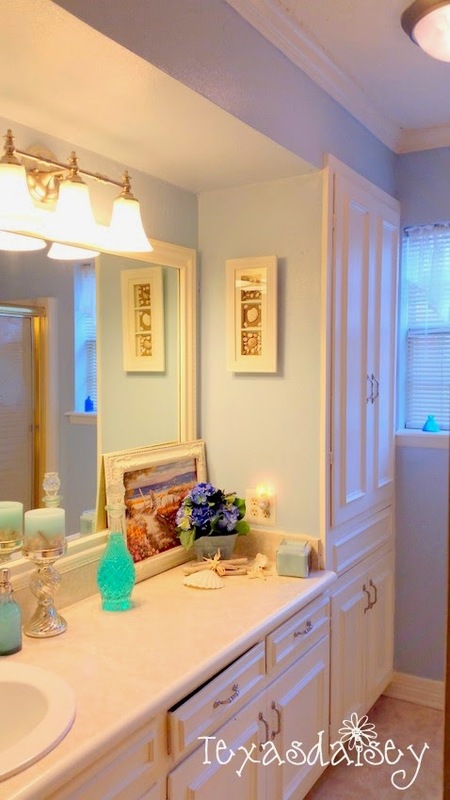 I wish I had taken more pictures before I redid the bathroom and other rooms in the house but at that time, I wasn't really into taking pictures. Things have sure changed...now I love taking pictures. 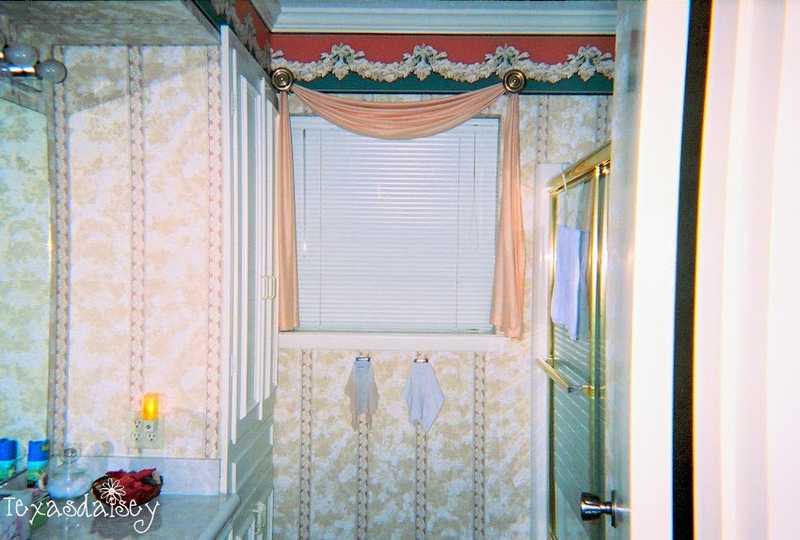 Anyway, here is my other picture of the bathroom before we purchased the home and before I redid it. I used my secret weapon to remove the wallpaper...my homemade wallpaper remover spray. You will never guess what I found underneath this wallpaper. 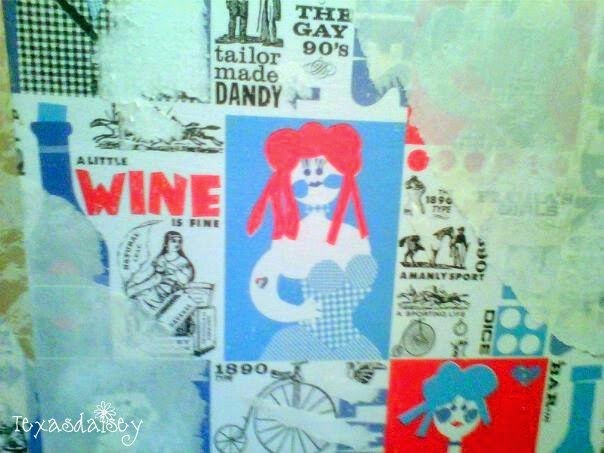 Even uglier wallpaper! It was quite the style but certainly not mine. I persevered and removed that wallpaper too. Next I patched up the walls where there were holes, and dings with some joint compound. I also taped and bedded the walls in preparation for new textured walls. I scraped the popcorn ceilings and retextured the ceiling. I used a roll on texture and painted the walls a pretty blue. The new colors allowed me to use my pretty glass collection and seashells. 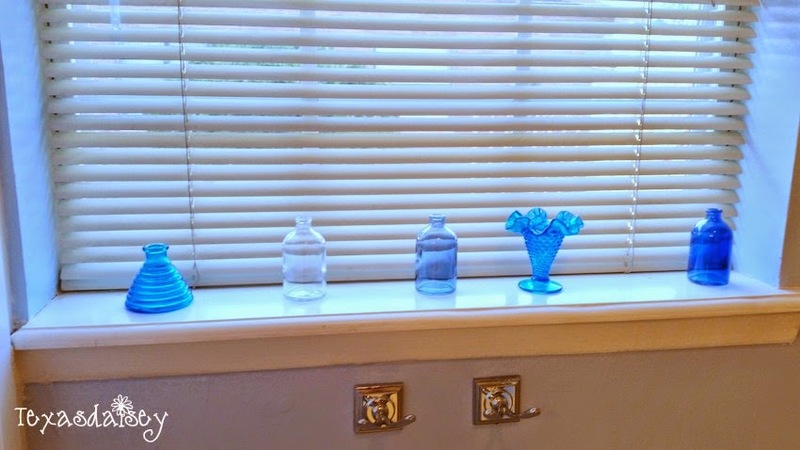 I also changed the light fixtures, faucets, handles, towel bar, and hooks to give my bathroom a fresh updated look. A new coat of fresh white paint for all the woodwork brightened the room. I also added a pretty moulded trim to make a frame around the wall mirror. There are a few more changes that have happened but I want to share those in another post. 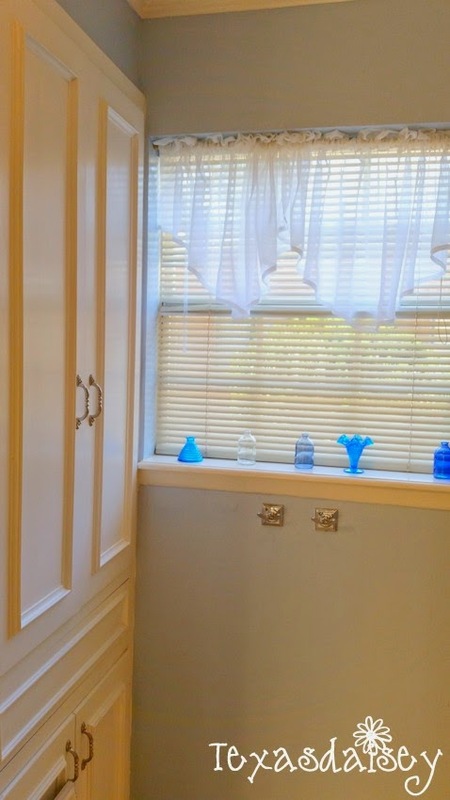 I am very pleased with how well my guest bathroom turned out. Sometimes I even like to go in there and take a bath just so I can enjoy the pretty sea inspired room. 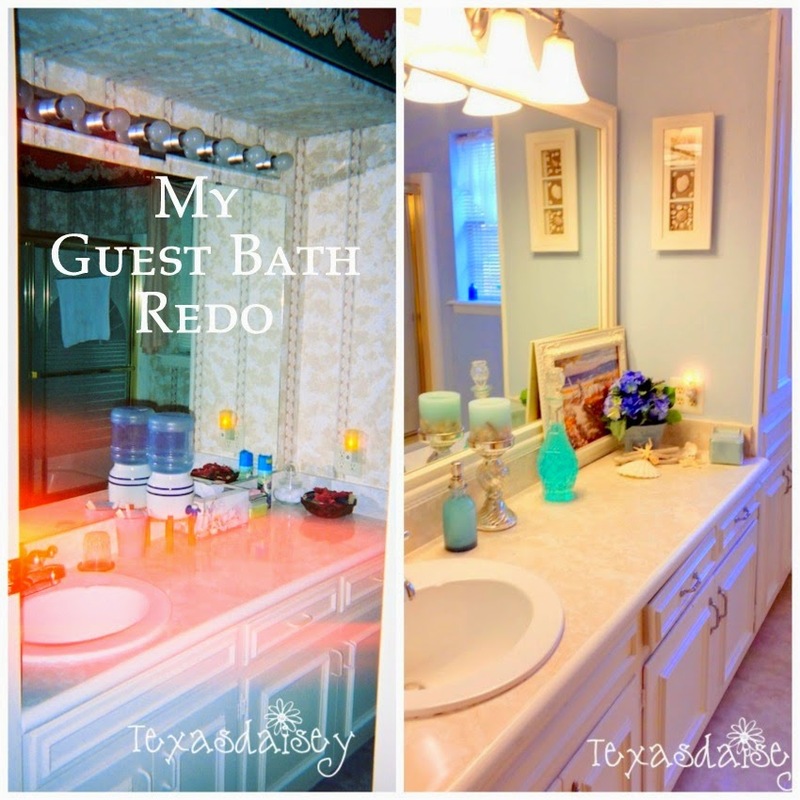 Now you have seen my guest bathroom redo. 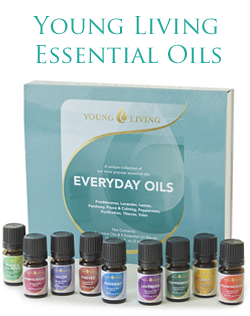 What are you working on in your house? I would love to hear about it in the comments. Bless your heart on removing that wallpaper. Such a chore! The renovation turned out wonderful! Thank you so much. It wasn't that bad at all to remove with my homemade wallpaper remover. Was just a surprise when I found it and what style it was lol.